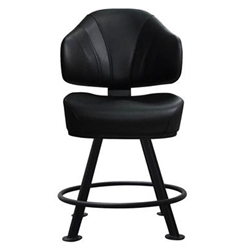 Heavy Duty Commercial Gaming stool. Black, 100,000 Heavy Duty Commercial Vinyl. Welded steel, Powder coated Black. Other Vinyl and Fabric colours availabe on Qty indent order.